Measure carefully, placing all ingredients except cherries and beaten egg in bread machine pan in the order recommended by the manufacturer. Select Dough/Manual cycle. Do not use Delay cycle. 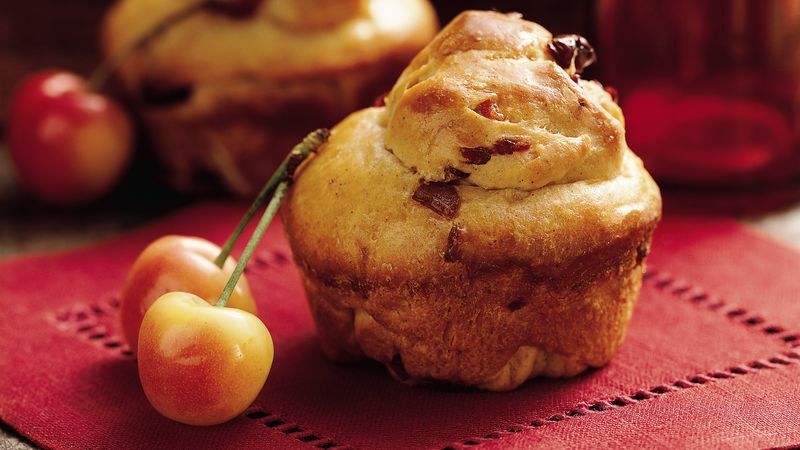 Add cherries at the beep signal or 5 to 10 minutes before the last kneading cycle ends. Grease 12 large muffin cups, 3x1 1/2 inches. Divide dough into 16 equal pieces. Shape each piece into a ball, using floured hands. Cut 4 balls into 3 pieces each; roll into small balls. Place 12 large balls in muffin cups. Make indentation in center of each large ball with thumb. Place 1 small ball in each indentation. Cover and refrigerate 2 hours. Remove rolls from refrigerator. Let rise covered in warm place 40 to 45 minutes or until almost double. Heat oven to 350°F. Brush beaten egg over rolls. Bake 22 to 26 minutes or until golden brown. Immediately remove from pan. Serve warm, or cool on wire rack. Dried blueberries or cranberries or chopped dried apricots can be used for the dried cherries.